Solitaire veterans, time to prove your possession of talent and fortune in Cruel Solitaire! Your goal in this game is to move all cards by suit from A to K to the foundations. ..
A fantastic crossover of the famous Demon Solitaire and Forty Thieves Solitaire, Demons and Thieves will test your organization ability amidst different arrangements. Your goal in ..
Aces and Kings is a difficult yet intriguing solitaire game using 2 decks of standard playing cards to play. Your goal in the game is to move all cards to the foundations from A ..
As unusual as it seems, Crazy Quilt is a challenging and fun solitaire game. Using 2 decks of standard playing cards, your goal in this game is to move all cards to the 8 .. Gypsy Solitaire is an intriguing card game using 2 decks of standard playing cards, and your goal is to move all cards by suit from A to K to the foundations. When the game .. 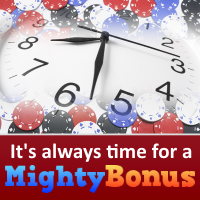 Using your skills at Black Jack, try to earn as much money as you can! A fun Tic-Tac-Toe game where you can play against one of your friends, or challenge the computer and test your.. Play Ocean Princess slot demo from Playtech, with 5 pay lines and 5 reels. This strange looking slot brings yo..
A great little strategy game for you poker players out there. Set the cards to make the best poker hands verti.. The player gets in a mysterious casino to solve secret of Magic Cups. On a game table there are 3 Cups and 1 B.. In this game you need a mixture of skill and the ability to play Poker. Its your task to controle a little spa..
Six by Six is an unusual and difficult solitaire game. Cards can be moved singly around the tableau onto card..
Roulette is a simple and fun game to play at all online casinos. Roulette, meaning "small wheel", consists of ..
Use your ESP and card counting skills to guess whether the next card out of the deck will be higher or lower t.. In this sequel to Coy Card, you play by the same rules except there is no stopping in between levels. Plus, t..
Wester Solitaire poker is based on solitaire card games. As the cards are dealt one at a time from the desk, .. This is a Pachinko game (Japanese Pinball), a mix of slot machine and pinball. The player has to controll the ..
An interesting & unusual 2-deck solitaire game - try to pull the 'threads' from the 'quilt' and sort the cards..